I have to say I prefer the Old Jameson's Distillery as a visitor attraction to the Guinness Storehouse for the simple reason that the tour here is guided whereas in Guinness’s you are left to your own devices. Which can be very pleasant, especially above in the Gravity Bar with a view of the city and a pint in your hand, but for me I want something more? I like to leave a place a little bit wiser and in Jameson's case (a little bit tipsy) having learned something. Properly guided tours will do that for you and at Jameson's it’s very well done, just the right length of time and information to hold your attention, finishing up with a genuinely, convivial tasting session in the Jameson's Bar. Perhaps, when you understand how something is made you appreciate it more? It’s quite amazing how three simple ingredients, barley, water and yeast can be turned into ‘uisce beatha’ or the water of life? And interesting too, how each of the processes, whether it was the malting of the barley, the marrying of the whiskey in casks or the vatting into bottles, shaped the lives and social history of such a small part of Dublin. Surely they could never have imagined Jameson's whiskey becoming the global phenomenon it is today. Situated in an historical part of Dublin, Smithfield market is surrounded by cobbled streets. The original building is lovely with a theatre, bar, shop and restaurant, which seems to be very popular with ‘legal people’ (which must make for some great people watching) from the nearby Four Courts. 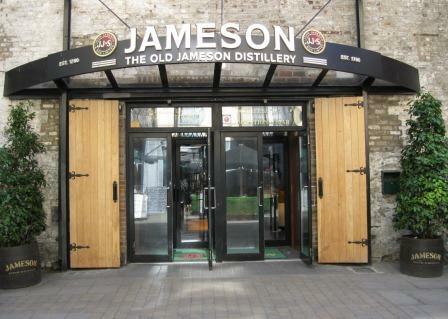 Old Jameson Distillery, Bow St, Smithfield, Dublin 7.